Click on the bars below to view all the subdivisions in Byers. You can also view the most popular searches such as ranch style homes, new construction, homes with a pool or houses with mountain views. Click to see Local Subdivision and Complex Maps. What is Your Byers Home Worth? Byers is a small Colorado town that is ideally located east of Denver, straddling the I-70 providing fantastic transport links to the big city deep within the East Metro region. While a small town, Byers provides residents with a cozy community spirit that is built around a characterful location amongst Colorado’s natural beauty. People visit Byers to connect with the outdoors, but they stay for the choice of homes in an affordable, welcoming, and secure town. Homeowners have become increasingly attracted to Byers CO due to its direct access to Denver along the I-70, making it an ideal location for commuters. Byers is a growing community that already provides a consistent choice of homes, especially for those who embrace nature. As a small town, Byers Colorado only hosts three subdivisions; Bijou Valley Estates, Mountain View Estates, and Ranch Wood at Bijou Creek. Each of these communities embraces the outdoors by providing at least one-acre plots, while all are horse-friendly with specific zoned sections for our equestrian friends. Byers also has a downtown section where homes are available, although no townhouse or condo complexes are available in the area. Interestingly, Byers has become a favorite amongst those seeking an affordable home in Colorado, with most properties valued at under $500k. Residents with children setting up home in Byers will attend the Byers Public School in the Byers 32-J School District. While Denver is easily accessed, Byers has plenty of things to see and do to keep residents occupied. In recent years, Byers CO has seen increasing interest around its various rodeo activities, most notably the Rodeo Series. Also available in the town are Team Roping Practices, and every 4th of July there is a large parade, festival, and rodeo. 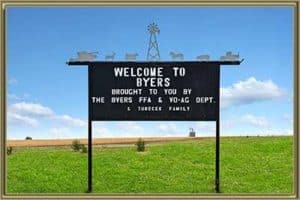 For those wanting to connect with the community and have fun in Byers, the annual “Turkey Shoot” takes place the second weekend before Thanksgiving every year. Considering Byers is a small town of under 1,500 people, it supplies plenty of amenities such as retail locations, eateries, and entertainment. With homes set amongst generous plots and with affordable prices, Byers Colorado has become an increasingly popular choice for homeowners. With a taste of Colorado’s beauty and a winning community spirit, there’s a lot on offer in the small town of Byers. See all the Things to do in Byers, CO. Here at Gold Compass Real Estate, we understand buying or selling a property can often be a complicated task. If you are selling a home in Byers CO, our team of expert agents can provide advice and knowledge on the local market, including price trends. We will also give you a Byers Home Value Instantly Online, so you can gain more confidence when selling your property. As a leading expert on selling and buying homes across Colorado, Gold Compass Real Estate is your very best solution when buying property in Byers. Our qualified team of agents understands the local market, including what is on offer in individual subdivisions and things to do in the community. Our Byers Colorado team will supply you with a complementary Free Personalized Market Report, which helps you gain confidence in the local market. Our online database is updated frequently to reflect changing prices and market listings, so call Gold Compass Real Estate at 303-325-5690 to discuss buying or selling property in Byers CO.